Sorry about the late update, been pretty busy. I'll have it up after Blizzcon, anyone else going? Ever been in a boss fight with loot you want and then realize you didn't grab the bonus roll token? If you hurry and go grab your bonus tokens after the fight, you will still have the opportunity to roll. 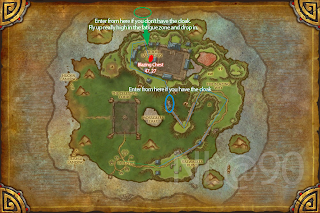 Once you have the tokens, either zone back into the instance or go to a different continent. Your bonus roll meter will pop up. This works for both raid dungeon bosses and world bosses. The last raid of MoP is here, thank you all for reading. Do I need to start No Life at 95 soon? Have you visited Timeless Isle? If you have, you probably have too many purple items already. If you have no use for the 496 items, they can be upgraded with a Burden of Eternity. The burdens are a rare drop from chests and creatures on the island, using them on any timeless token besides the trinket will yield a randomly rolled 535 iLvl item for that slot. They are also sold for 50k timeless coins from Mistweaver Ai. There are two guaranteed Burdens that you can pick up, one is pretty easy to get. It comes from the Blazing Chest, a rare chest you can only loot once per character. The chest is located in the Ordon Sanctuary. There's a few ways to get to it. You'll need _NPCScan. You can use the Paste addon to get all this in at once or paste them one line at a time or paste a few in a macro.